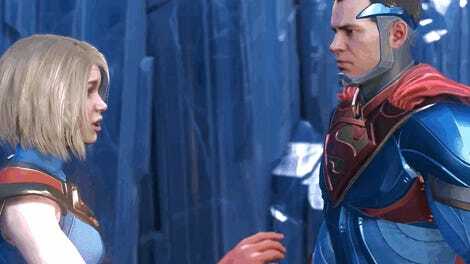 In the Injustice universe, Kal-El wanted to rule the Earth in an ostensibly benevolent dictatorship, but a lot of people ended up dying at the Man of Steel’s hands. Brainiac? He’s coming to Injustice 2 to in an attempt to top Superman’s “achievement” by destroying the whole planet. If you were wondering what might possibly bring Superman and Batman—who are friends-turned-mortal-enemies in this continuity—back together, the answer is an evil 12th-level intellect AI that destroyed Krypton. Things don’t look good for some of the heroes showing up in the sequel to Netherrealm’s DC Comics-based fighting game, particularly Green Arrow and Black Canary. It’s an open question as to whether Superman will get back to being a boy scout in this universe. The appeal of the Injustice concept has been watching the characters act in ways that diverge wildly from their more traditional iterations. We’ll see where things wind up when Injustice 2 comes out next month.